PF-4708671 is a cell-permeable inhibitor of p70 ribosomal S6 kinase (S6K1 isoform) with Ki/IC50 of 20 nM/160 nM in cell-free assays, 400-fold greater selectivity for S6K1 than S6K2, and 4- and >20-fold selectivity for S6K1 than MSK1 and RSK1/2, respectively. 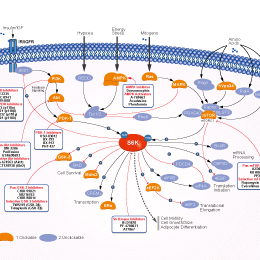 First S6K1-specific inhibitor to be reported. (F) EGR-2 and GFI-1 abundance (n = 5). Front Immunol, 2017, 7:685. PF-4708671 purchased from Selleck. Tumor sections were examined for DNA fragmentation (TUNEL) or stained with Ki-76 antibody. The representative images are shown. The brown color indicates the positively stained cells; scale bar, 50 mm. Mol Cancer Ther, 2015, 14(3): 799-809. PF-4708671 purchased from Selleck. C. Cell lines were treated with the indicated compounds for 24h. ABC cells are colored in red. GCB are colored in blue. Intermediate cells are colored in gray. Oncotarget, 2016, 7(8):9163-74. PF-4708671 purchased from Selleck. Effect of PF-4708671 on lipid accumulation and expression of lipogenic genes in HepG2 cells. Cells were exposed to 6 μM PF-4708671, 144 μM PA (sodium palmitate), or 14 nM RAPA (Rapamycin) for different periods of time. (b) The intracellular lipid content in each group was quantified. (c) Detection of TG levels. Nutr Metab (Lond), 2018, 15:31. PF-4708671 purchased from Selleck. After treated with PF-4708671 (PF, 10 uM) and 4EGI-1 (50 uM) for 48 h, GRP78 and ATF4 in QBC939, RBE and HCCC-9810 cells were analyzed using western blot. PLoS One 2014 9(2), e90388. PF-4708671 purchased from Selleck. Pearce LR, et al. Biochem J, 2010, 431(2), 245-255. Whether the in vivo formula "30% PEG400+0.5% Tween80+5% Propylene glycol" for S2163 is suitable for i.p. or not? The formula "30% PEG400+0.5% Tween80+5% Propylene glycol" on our website is an oral one. It is a suspension. LY2584702 is a selective, ATP-competitive p70S6K inhibitor with IC50 of 4 nM. Phase 1. LY2584702 Tosylate is a selective, ATP-competitive p70S6K inhibitor with IC50 of 4 nM. Phase 1. BI-D1870 is an ATP-competitive inhibitor of S6 ribosome for RSK1/2/3/4 with IC50 of 31 nM/24 nM/18 nM/15 nM in cell-free assays, respectively; 10- to 100-fold selectivity for RSK than MST2, GSK-3β, MARK3, CK1 and Aurora B. 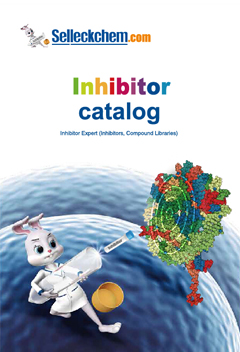 Features:The first allosteric small molecule inhibitor of Akt to enter clinical development. CHIR-99021 HCl (CT99021) is hydrochloride of CHIR-99021, which is a GSK-3α/β inhibitor with IC50 of 10 nM/6.7 nM; CHIR-99021 shows greater than 500-fold selectivity for GSK-3 versus its closest homologs Cdc2 and ERK2.